To download your 40 FREE coloring pages, click the link at the bottom of this page. If you’d like to get 87 more coloring pages, for just $5 click here. This offer only lasts for 15 minutes, and then the 127-page bundle goes back up to the full price of $12. 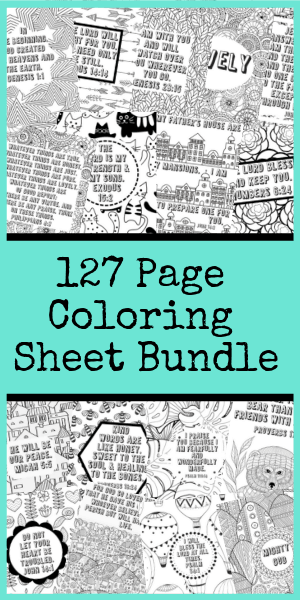 This bundle includes 127 original coloring pages. Each page has a full scripture or portion of a scripture on it to color. Some pages are companion pages for the main scripture. Let us answer your question with a question. If the answer is yes, then we think you’ll love this bundle and find hours of entertainment with these detailed coloring sheets. Not only are the backgrounds filled with intricate designs to color, but each letter in the scripture can also be colored! Are these pages appropriate for kids? We use these pages with our own kids (ages 2-10) to help reinforce our weekly scripture memory work. The detailed artwork helps to teach children to stay focused to finish the task plus it builds fine motor skills. Five dollars seems too good to be true. What’s the catch? There’s no catch except that the $5 deal only lasts for fifteen minutes. After that, the bundle goes back up to the full price of $12. 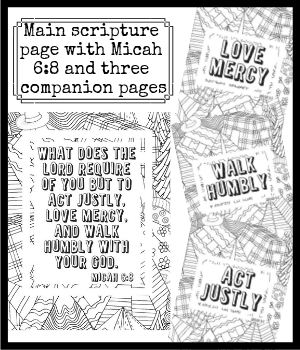 We started designing these pages to use with our own kids because we couldn’t find printable scripture coloring sheets that were affordable. We wanted a PDF so we could print multiple copies of the same page (our youngest daughter is a bit of a perfectionist and often needs to start over several times) AND not have to worry with keeping up with a physical copy. We got several requests from friends for copies for their kids, so we decided to make it available to the public. We want to help all parents teach their kids scripture and coloring is a great way to get started. You’ll be amazed at how much they remember after simply coloring the pages. You will get an email with a link to download a PDF with 127 coloring pages. The link will never expire, so you will always have access to it. No, thanks. I’m good without these extra pages. To download your 40 FREE coloring pages, check your email for a link or CLICK HERE TO SIGN IN TO THE PRINTABLE LIBRARY.